China is expected to complete construction and fitting work on a prototype of its 500-ton liquid rocket engine within the year, progress toward China's manned interstellar travel programs, Chinese experts said. Liu Zhirang, head of the No.6 Research Institute of the China Aerospace Science and Technology Corporation (CASC), who is also a deputy to the 13th National People's Congress, made the remarks on Sunday, China's Science and Technology Daily reported on Monday. 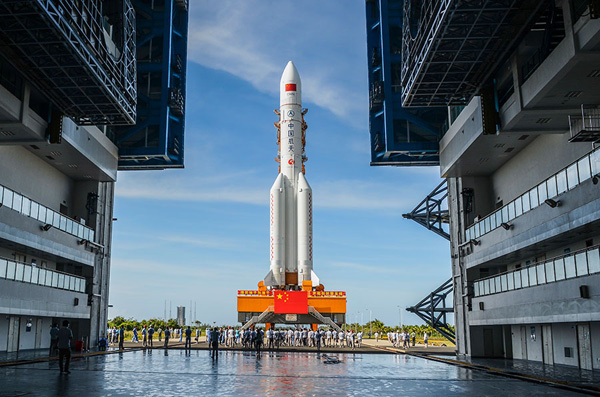 From the prototype to the final delivery of the engine, it would normally take at least five years, which is in keeping with the China's Long March-9 launch schedule, Song Zhongping, a military expert and TV commentator, told the Global Times on Monday. To move from the 120-ton engine to a 500-ton one is not simply an enlargement, but requires overcoming exponential growth in technological difficulties. For example, as the thrust power increases, new significant challenges surface such as issues related to its physical design, thermal resistance and conductive technologies, among others, Liu noted. China's heaviest-lift carrier rocket, currently called the Long March-9, will be sent into space by 2030, according to the Science and Technology Committee of the China Academy of Launch Vehicle Technology, Xinhua News Agency reported. The Long March-9 rocket's carrying capacity will exceed 100 tons with a diameter of around 10 meters. Judging from the efforts China is investing in researching and designing launch vehicles with super lifting capabilities, it is definitely going for interstellar travel and deep space exploration programs, such as manned lunar landings and super-sized space stations, Song added, while noting that such super heavy-lift rockets are especially made for such missions and can compete them more efficiently. China's heavy-lift launch vehicles, the Long March rocket series, have completed seven successful missions in 2018, with the Long March-3B rocket launched on February 12 from the Xichang Satellite Launch Center in Southwest China's Sichuan Province, the Xinhua reported. 2018 will see 36 launches of the Long March rocket series, with 14 missions carried out by Long March-3A rockets and six by Long March-2C rockets, according to the report.